No matter which segment you have your eye on, every new car is expensive. For this reason, it only makes sense that you should be selective and do your research before signing on the dotted line. When it comes to compact cars, the 2016 Volkswagen Jetta in Las Vegas NV is an excellent choice for shoppers seeking a balance in economy options. With the Jetta you get an engine that won’t leave you struggling to reach highway speeds, while having features and a nice interior. The new model year is more powerful than ever, receiving a standard turbocharged engine to make it match what’s offered in the rest of the lineup. This 1.4-liter turbo four delivers 150 horsepower and 184 pound-feet of torque, which is a full 35 extra horses and 59 more pound-feet of torque over the previous model year. There are a total of four powertrain configurations, including the more potent Jetta Sport, the efficient Jetta Hybrid and the attractive performance-inspired Jetta GLI. Volkswagen aims to provide a fine balance in the Jetta, providing a mix of the features most drivers can’t live without, and a few extra benefits, while keeping its overall price low. Standard in the base model is the 5-inch touchscreen system, Bluetooth with audio, cruise control, a USB port and cloth seating. The 1.4-liter turbocharged four-cylinder engine is new for the 2016 model year, replacing the 2.0-liter naturally aspirated engine that previously powered the Jetta. This new engine provides 150 horsepower and 184 pound-feet of torque. A 5-speed manual is standard, but a 6-speed automatic is available. One benefit of turbocharged engines is they not only have better power output, but they provide it in a more efficient manner. Savvy drivers can achieve an EPA-estimated 28 city and 40 highway mpg rating, which is an improvement over the previous model year and is an excellent rating for its class. If the 2016 Volkswagen Jetta looks attractive in pictures, it only impresses more in person. The model comes in eight different color options, many of which are attractive metallic shades. Looks alone won’t cut it for smart drivers, but they certainly don’t hurt. The interior is equally attractive, providing a better value than many vehicles within the segment and allowing for a comfortable ride even on longer road trips. This is partially thanks to the four-corner independent suspension with front MacPherson struts, which creates a smoother ride while also providing a greater feeling of control behind the wheel. Standard features in the 2016 Volkswagen Jetta include Bluetooth with audio, a USB port for charging and connecting mobile devices, the 5-inch MIB II infotainment system, cruise control and a multi-function steering wheel. Available features found in higher trims include a rearview camera system, the larger 6.3-inch touchscreen with App-Connect, push-button start and more. 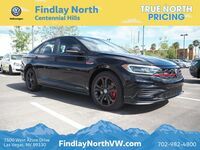 The 2016 Volkswagen Jetta is available now at Findlay North Volkswagen serving Henderson and Las Vegas, NV. Schedule a test drive to see for yourself if it’s the right option for you.